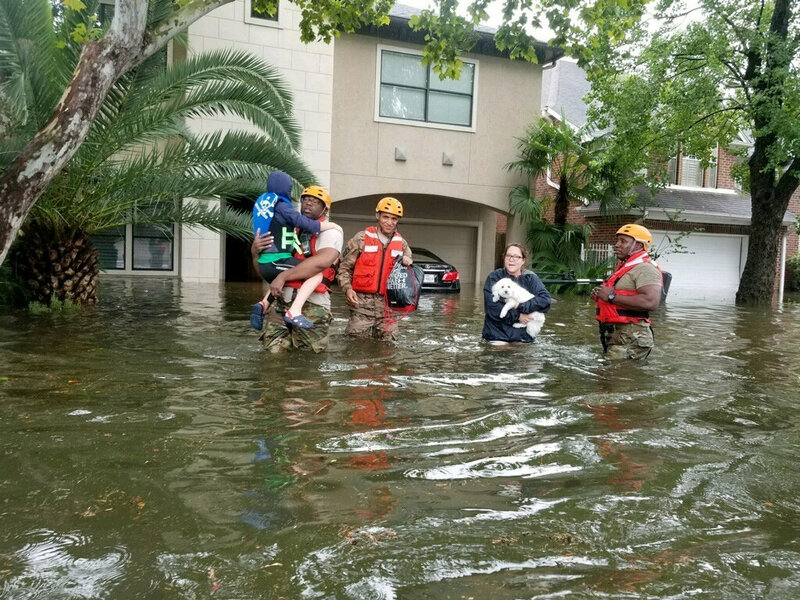 HOUSTON (CNS) — With floodwater as high as 20 feet from swelling bayous and waterways, thousands of homes in the Archdiocese of Galveston-Houston flooded as Tropical Storm Harvey continued to batter southeast Texas Aug. 28. Bishops from dioceses along the mid-Texas Gulf Coast, including Victoria and Galveston-Houston, granted dispensations from regular Mass Sunday obligations Aug. 27. The storm, which made landfall a day earlier as a Category 4 hurricane, was downgraded to a tropical storm and claimed at least four lives. The record-breaking rainfall, as much as 28 inches over 24 hours in four counties in the archdiocese, was “unprecedented” and “catastrophic,” according to the National Hurricane Center. The region typically sees about 49 inches of rain in a year. In southeast Houston, Father David Bergeron, a member of the Companions of the Cross order, spent Saturday night in his truck on a highway because of rising floodwater. The next morning, he kayaked the flooded streets to try to find wine to celebrate Sunday Mass for nearby stranded neighbors. Sitting atop his red kayak, Father Bergeron told a local TV reporter on a live broadcast that he was trying to return home to celebrate Mass. He had visited Galveston for a kayak trip the previous day. “I tried to go back home for Mass and … I didn’t make it,” Father Bergeron said. The priest used his kayak to visit a nearby convenience store for supplies as well as wine to celebrate Mass for nearby stranded neighbors. He said he was praying for everyone in need, reflecting on America’s first evangelizers who came by boat. Thirty miles north of Houston, 29-year-old Eric Robinson spent the morning of Aug. 27 walking three miles in floodwater to morning Mass at Sts. Simon and Jude Catholic Church in The Woodlands even though a dispensation had been given. In his homily, Father Pat Garrett, pastor, encouraged people to pray for flood victims and first responders. After Mass, Robinson trekked back to his apartment, wading through waist-deep water. The situation was not the first time the parish has seen floodwater come close to church grounds. In April 2016, the church’s center served as a Red Cross shelter. Activated again as Harvey pounded the state, at least 22 people took shelter at the church by the evening of Aug. 27, parish staff said. Sacred Heart Church in Rosenberg, 35 miles southwest of Houston, also served as a Red Cross shelter. Elsewhere, Danielle Noonan walked through her Sienna Plantation neighborhood southwest of Houston Aug. 27, observing the damage caused by a tornado that ripped through area the previous evening. “I feel like I’m still in shock,” she said. No sooner than her husband Chris told her to get into the closet where her two sons already were hiding, the tornado touched down a quarter-mile away, damaging at least 50 houses, shredding roofs and windows, snapping hallowed oak trees “like toothpicks” and flipping fences. The next day, the community tried to recover quickly, but strong rains hampered efforts. Not until a trip to the grocery store for more supplies did Noonan see how shaken by the tornado her two children were. Noonan saw it as a good teaching moment about how to live a life of true prayer and love in the community. In an effort to rally the local churches in prayer, Noonan joined her parish, St. Angela Merici in nearby Missouri City, in hosting the Chaplet of Divine Mercy and praise and worship session on Facebook. Noonan and her family evacuated to central Texas Aug. 28 under orders of local officials because of rising waters in the Brazos River. Meanwhile, a social media post about storm damage caused Ashley Ben-David’s jaw to drop. Scrolling through Twitter, the Houston St. Francis de Sales Catholic School fourth grade teacher saw images of hurricane-ravaged Rockport. The seaside city 30 miles northwest of Corpus Christi was among the first to see major damage from the storm. A photo showed a storied home in the Ben-David family decimated by Harvey; the two-story structure painted in friendly yellow and white was cut in half by winds that topped 130 miles per hour. At first she denied what she saw in disbelief. “The stairs aren’t in the right spot,” she thought. However, after sending the picture to her two siblings, they confirmed the worst: It was the family home, only Harvey had moved the stairs and trees. “We’ve had that house in our family for so long,” said Ben-David in the safety of her Sugar Land, Texas, residence. The home belonged to her grandparents in the 1960s, and for the next half-century, played host to “countless summers, vacations, Christmases and Easters,” for the family. Information about contributing to storm relief efforts is available at the Texas Catholic Conference website, https://txcatholic.org/harvey/. Catholic Charities USA also is accepting contributions at https://app.mobilecause.com/vf/CCUSADISASTER.